Press Release: New York, NY, May 5, 2016 - Adam Bernstein, an award-winning and critically-acclaimed television and film director, will serve as Director and Executive Producer for the premiere episode of Spike’s new scripted series, "The Mist." From TWC-Dimension Television (TV) based on the classic Stephen King novella, "The Mist" goes into production this summer and airs in 2017. The announcement was jointly made today by Sharon Levy, Executive Vice President, Original Series, Spike TV and Bob Weinstein, Co-Chairman The Weinstein Company. Bernstein’s extensive resume includes many of the most decorated series on television over the last 15 years including directing the pilots for "Fargo," "30 Rock," and "Scrubs." "His impressive credits also include "Better Call Saul," "Breaking Bad," "Californication," "Shameless," "Bored to Death," "Oz," "Homicide: Life on the Street," and "Entourage." In 2006, he won a Primetime Emmy(R) Award for Outstanding Comedy Series for "30 Rock." Bernstein also directed many of the most popular and memorable music videos including "Love Shack" for the B-52s, "Hey Ladies" for the Beastie Boys, and "Baby Got Back" for Sir Mix-A-Lot. Bernstein is also noted for directing "The Adventures of Pete and Pete," the first original programming for Spike’s sister-channel, Nickelodeon. He is currently repped by ICM Partners. "The Mist" tells a harrowing story about a seemingly innocuous mist that seeps into a small town and creates immense havoc. Christian Torpe serves as the Executive Producer for Spike’s "The Mist." Torpe created the successful show RITA in Denmark, now finishing its fourth season, and has developed programming for both Showtime and AMC. 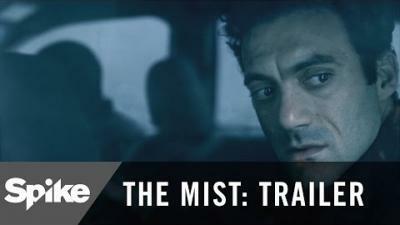 Spike has ordered 10 one-hour episodes of "The Mist." Spike TV debuted its first scripted event series in eight years, "Tut," last July to strong ratings and has recently ordered to series, "Red Mars" based on Kim Stanley Robinson’s award-winning "Mars Trilogy." Spike TV is available in 91.4 million homes and is a division of Viacom Media Networks. A unit of Viacom (NASDAQ: VIA, VIAB), Viacom Media Networks is one of the world’s leading creators of programming and content across all media platforms. Spike TV’s Internet address is www.spike.com and for up-to-the-minute and archival press information and photographs, visit Spike TV’s press site at http://www.spike.com/press. Follow us on Twitter @spiketvpr for the latest in breaking news updates, behind-the-scenes information and photos. Official Synopsis: The Mist centers around a small town family that is torn apart by a brutal crime. As they deal with the fallout an eerie mist rolls in, suddenly cutting them off from the rest of the world, and in some cases, each other. Family, friends and adversaries become strange bedfellows, battling the mysterious mist and its threats, fighting to maintain morality and sanity as the rules of society break down.